Learn more about the TLX’s performance, numerous packages, and high-tech features, then begin exploring the TLX inventory at Acura of Milford near West Haven. The standard engine delivers 206 hp and 190 lb-ft of torque and is paired with an eight-speed dual-clutch automatic transmission, the first of its kind in the industry. This available engine boosts power to 290 hp and 267 lb-ft of torque and is paired with a nine-speed automatic transmission with paddle shifters. The precision all-wheel-steer system is the first of its kind on a front-wheel drive vehicle. The top angle of each rear wheel adjusts independently to enhance agility and stability. The Super-Handling All-Wheel-Drive system distributes torque exactly where it's needed so that you have superior control when cornering or driving in harsh weather. Standard fuel-efficiency ratings of 23 mpg city and 33 mpg highway* help you go farther for less. Selectable driving modes – Normal, Econ, Sport, Sport+ – let you customize the vehicle’s tuning and specs for exactly how you prefer to drive. The performance is smooth and stable driving dynamics in average conditions. The performance is also agile and athletic when you need the car to drive at its peak. To really get a feel for what this car can do, we suggest you test drive the V6 powertrain first. When you do, it will be clear why this model is tough competition for the Lexus ES50 and the BMW 2-Series. 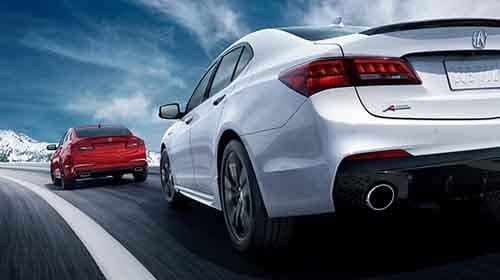 Visit Acura of Milford to climb behind the wheel and explore TLX package upgrades, including models with the Advanced Package equipped, and depend on us to handle all your financing needs. If you need directions or more information please contact us at your convenience.